Did you hear the Disney Magic was just “reimagined”? 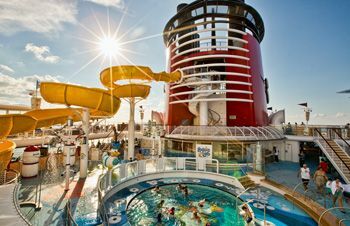 They recently dragged me off I recently returned from the inaugural sailing of the new Disney Magic, and (spoiler alert!) I loved it. Since I had also spent 12 wonderful nights on the Magic this summer before she went to dry dock, I had a very recent experience to compare the “old” Magic to the “new” Magic. So, let me tell you my impressions (and reviews) of the new Magic (and her new features)! 1. AquaDunk – The AquaDunk is by far my favorite addition. I’m not a big fan of body slides, but it’s a complete rush. It lasts all of 7 seconds and yet somehow feels like you fall for at least 7 minutes. 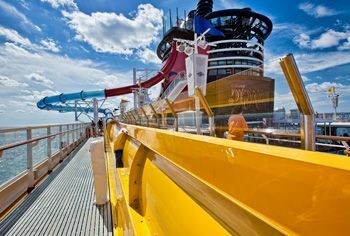 Some critics of the AquaDuck on the Disney Dream and Fantasy felt like it was too tame. Not so with the AquaDunk. You step into a vertical tube with water pouring down your back and a Plexiglas door closes around you. After you give the thumbs up signal that you’re ready, Huey, Duey and Louie count you down, then the floor drops out from under you and you fall. And fall and fall and fall! Oh, and twist through a tube that goes out over the ocean, which is more than 100 feet below you. The wait was short on my sailing, but it certainly could be long during a hot afternoon at sea. Ride first thing in the morning or during the evening shows. If you’re onboard during a port day, the line should be short, as well! 2. 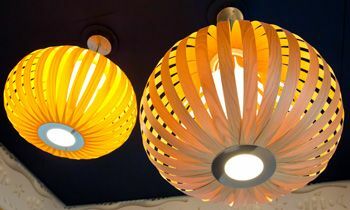 Kids’ Clubs – While Vibe (the teen club) and Edge (the tweeners club) appear pretty much unchanged, the Oceaneer Club and Oceaneer Lab are almost unrecognizable. And they are amazing! The Lab and adjoining hallway to the Club are almost identical to the similar spaces on the Dream and Fantasy. It’s a nautical theme with light colored wood and leather chairs. There are video games, computer consoles, tables for arts and crafts, and more. It looks great. The Club is designed in that hub and spoke pattern that Disney loves so much. The “hub” is a huge bright open space with a huge video screen and wall of giant library books on one side. The spokes consist of Pixie Hollow, Andy’s Room, Mickey Mouse’s Clubhouse and the Avengers Academy. Pixie Hollow is a forest-themed dress-up and play area with computer games, costumes, and an activity table. It’s very similar to Pixie Hollow on the Dream and Fantasy, and as cute as it is, seemed to hold the least appeal of the area to the children playing. Andy’s Room is a show stopper. It’s set up like a giant bed with a circular Slinky Dog slide (yes adults will fit, don’t ask how I know this) off the top, and giant toys like Mr. Potato Head underneath. 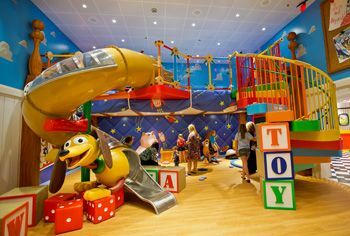 Mickey Mouse’s Clubhouse is a Mickey-themed activity room with a giant screen on one side and game consoles lining another. Right next door is the wonderful Avengers Academy. 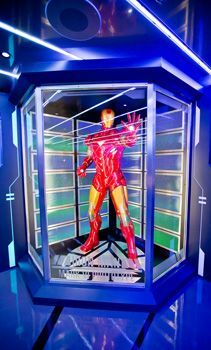 The Avengers Academy has Captain America’s shield, Thor’s hammer, and a life-size Iron Man suit! Talk about curbside appeal! The large video screen has an enthralling interactive Iron Man game among other things. This room is a Marvel fan’s dream. When the Magic and Wonder were introduced, the kid’s club areas were revolutionary. But it was time for an update. And this update is excellent. 3. 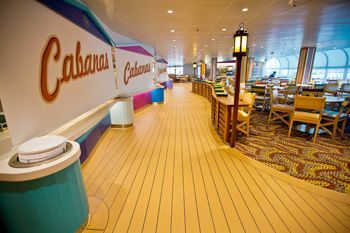 Cabanas – I never realized I disliked Topsiders until I stepped inside Cabanas on the Dream for the first time (a friend of mine wisely says that “Comparison is the root of all discontent”!). Topsiders was your typical, stand in a line, wait for the family in front of you to take 4 hours to decide between garlic mashed potatoes and macaroni and cheese, kind of buffet (I jest, I jest…). So painful! Cabanas is set up with several food stations, each serving something different. Visit only the stations you want and bypass those you don’t. I was beyond excited when I heard they were putting Cabanas on the Magic! I was confused, wondering how it could possibly fit in Topsiders’ smallish space, but I was excited! Well, Disney expanded the old Topsiders’ space to turn it into Cabanas and it feels huge. It’s also 100 times more functional and 100 times more awesome. 4. Carioca’s – I know some people loved Parrot Cay, but it was always my least favorite of the three main dining rooms on the Magic. It was really showing its age and the once bright colors were faded and dull. 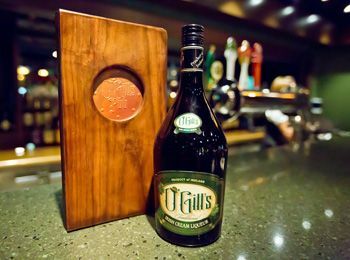 It was also a lot more casual than the other restaurants, which isn’t necessarily a bad thing, but not somewhere you wanted to end up on, say, formal night. Carioca’s is a great replacement. It’s bright and festive yet could feel elegant at the same time. Themed like a Brazilian restaurant, there are beautiful colorful lanterns hanging from the ceiling. One thing I really liked is that they attempted to hide the buffet stand which is used at breakfast and lunch but unnecessary at dinner. In Carioca’s there was a curtain with a nighttime panorama of Rio De Janeiro pulled down at dinner to cover the unneeded buffet stand. Not a perfect solution, but I appreciated the effort! The new menu is delicious. I loved the empanada appetizer and there’s nothing wrong with an entrée that includes meat on a stick. 5. New Staterooms – The stateroom reimagining is a touchy subject with some people, especially those who didn’t have a working toilet on the first sailing. 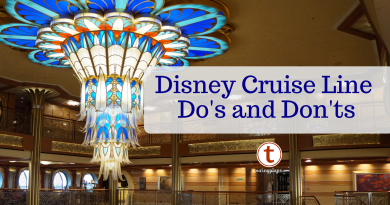 It does seem like the Magic has some unresolved plumbing issues and needed more time in dry dock to finish with the staterooms, but the good news is that Disney seems to be working hard to fix these issues. Recent passengers are reporting lots of ongoing work. Let me be clear here. The Magic has had plumbing issues for a while. The reimagination didn’t make the staterooms worse. They just haven’t fixed it all yet. Disney is still trying to fix the issues. 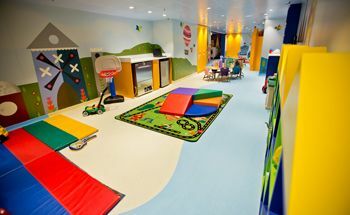 The good news is that the things they did change in the staterooms are great! The new bed is sooooooo comfortable. The bedding is soft and plush, and they finally threw out (and hopefully burned) those awful blue polyester bedspreads. They added more, greatly needed, outlets, and a more powerful hairdryer if the built in one in the bathroom doesn’t float your boat. The beds are 18 inches off the ground now, making storing luggage underneath much easier. The couch and curtains are updated and more attractive as well. Temporary problems aside, the staterooms are better. 6. AquaLab – The Mickey pool area and accompanying slide were completely redone and replaced with an 1800 square foot water playground. The most obvious difference is the Twist and Spout, a 3-story spiral waterslide. It’s a long and slow slide compared to the AquaDunk, but it’s quite fun and perfect for kids too short for the AquaDunk! Yes, I tried it! Right next to the slide is the water play area and pool. Water sprays from all directions, including above when the hanging buckets fill periodically and dump their contents. When I say water is spraying everywhere, I mean it. I walked by once without paying attention and ended up wet. Right next door is a Plexiglas-enclosed splash area made for the 3 and under crowd. The ground is soft and spongy and perfect for the little ones. The whole area is packed with visual appeal. Good luck trying to drag your children out of there. 7. It’s a Small World Nursery – The nursery formerly known as Flounders was a fine, if not spectacular, place to leave the little ones. The Fantasy and Dream improved on it with It’s a Small World Nursery and the Magic basically copied it. Which isn’t a bad thing. The nurseries on the Fantasy and Dream are adorable, and now the Magic can say the same. It’s a bright, colorful, inviting space. 8. Night Clubs – The night clubs were all redone for the better. Studio Sea was a family club whose décor of giant filmstrips was in desperate need of changing. It’s now called D Lounge and is brighter, more modern, and so much more inviting. The adult nightclub area is no longer called Beat Street. It’s now called After Hours. I really liked Diversions, but O’Gills has proven so popular on the Fantasy, I can understand why they felt the need to put in on the Magic and take up the biggest space for it. As a side note, I was amused this summer when we were trying to find a family game to play in Diversions and every board game we picked up was missing pieces. I understand pieces disappear, but is it really that hard to put new games in regularly? How much do board games cost again? I’m happy to report that there are brand new games in O’Gills! Your need to play scrabble with (live) friends will not go unfulfilled. Keys is a much smaller club with comfortable chairs and better spaces for small groups to sit and talk. I can attest to how inviting that is because we were there for hours doing exactly that. Fathoms is also an improvement over Rockin’ Bar D to me. There are booths along the back of the wall which are super comfortable and semi-private. The décor and gorgeous fiber-optic light fixtures are very hip and perfect for variety acts, and the dance club it becomes later at night. Count me disappointed, however, that the reimagined Magic doesn’t have some version of Skyline. Love, love, love those spaces on the Dream and Fantasy! 9. New Atrium – Disney redesigned the atrium of the Magic, to mixed reviews from me. I like that they took out one of the staircases. They really didn’t need it, and its removal makes the space feel a lot bigger. They also changed the carpet, and changed the chandelier from a beautiful Chihuly sculpture to a much smaller chandelier. That I don’t love. The new chandelier is very pretty, but the former chandelier was beyond pretty. It was gorgeous. The new chandelier does seem to fit the space a little more, it just doesn’t blow me away. Having said that, overall I do like the new atrium. The carpet is beautiful and the new added space is welcome. 10. 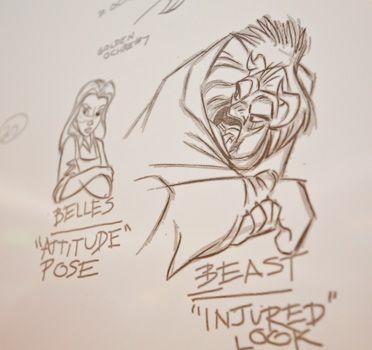 Animator’s Palate – When Animator’s Palate was introduced people were amazed. When I first experienced it, I was amazed. I remember that when I told people I’d been on a Disney cruise, Animator’s was the first thing they asked about. It was that cool! Over time it lost some of its appeal. It looked a little worn and the “show” didn’t really hold anyone’s attention who had seen it before. But, the first time I visited the new Animator’s on the Fantasy (and saw the new Animation Magic show), it was like the first time I experienced Animator’s Palate on the Magic. I was blown away when my drawing came to life on the screen. That is what Animator’s should be. It should blow you away. The new Animator’s on the Magic didn’t blow me away yet, but it looks much better. The screens are updated and easy to see. The sketches on the wall included new and clever drawings like the one shown on the right. The chairs are more comfortable, the dinnerware is adorable. The new Drawn to the Magic show on the Magic was okay, but it was really just an update of the original Animator’s show. The good news is that Disney does plan to do Animation Magic on the Magic. The bad news is that currently they are only planning on doing it on 7-night or longer cruises. Hopefully Disney will rethink that decision! So do you have any questions? Any areas I didn’t cover that you’re wondering about? With so many blogs and websites about Disney, a few stand out as being the very best and your opening line literally nearly made me fall off my chair laughing! Thank you so, so much for cheering up a dreary Autumn Thursday in England! Hi Tammy. Great column on the reimagined Magic. I just had the pleasure of spending 5 great nights on the Magic (11/10-15). This being our first Disney Cruise, I didn’t have anything to compare to DCL wise (have only cruised RCCL in the past), but knew there would be the Disney quality. Here’s my 2 cents: 1. Water slides/play areas were awesome. Hit the AquaDunk a few times and actually did it 3 times in about 5 mins on our Castaway Cay day when we returned before the masses. Also really liked Twist n’ Spout. Though not a “thrill” slide, if you get it right, you can get some speed. I can definately see how you could get soaked walking by the AquaLab, water just sprays everywhere, but both kids loved spending time there. 2. Kids Club – it was hard getting DD9 & DS4 (him particular) out of there. They actually told us to come back later one day… OK!!! The “Slinky Slide” was the big hit w/ DS4 and arts/animation w/ DD9. A big hit all around. 3. Staterooms – Thought they were in great shape. No issues to mention. Could have used a bit of paint on the outside railings of our verandah and there was some rust/grout issues around the bathroom door. New beds were super comfy and the kids loved the pull down “bunk”. We had to rotate nights so they each could have turns. 4. Animator’s Palate – Only one night in here, but we all had a blast. Overall, our best rotational dining experience. 5. Carioca’s – This is probably the only item I can disagree with you on. We were just not huge fans of here. The food was just ok, and while the decor was nice, the “screen” covering the buffet tables just looked out of place. Missed our 2nd dinner there due to Palo ressie, so maybe we just hit the food on a bad night (the 1st night). That does not come close to covering all of what can be said about the Magic, but for our 1st DCL cruise, it was a winner!! Keep doing what you do Tammy, we all enjoy your posts and pics! Thank you for reading, Eric! I’m so glad you enjoyed your cruise! I kind of agree about the screen in Carioca’s. It wasn’t quite the right look, but I still appreciate the attempt! We did love our food though! Hi, I really enjoyed your review, thanks. I have sailed on the magic several times before it was re-imagined. I have also sailed on the Fantasy and Dream. 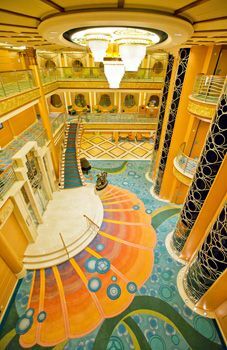 I was just wondering if you knew if the inside staterooms on the magic have been re-imagined as well? 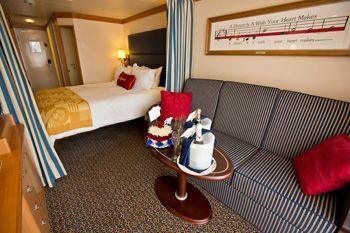 My partner prefers an inside stateroom as she doesn’t like seeing the ocean lol when you go on to book on the Disney Cruise Line web Page, the pictures that come up are of the old decor. Lol! I understand! I was on this one with friends. I can’t wait to go again so my family can try it!